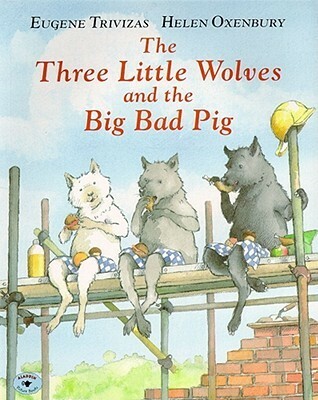 When it comes time for the three little wolves to go out into the world and build themselves a house, their mother warns them to beware the big bad pig. But the little wolves' increasingly sturdy dwellings are no match for the persistent porker, who has more up his sleeve than huffing and puffing. It takes a chance encounter with a flamingo pushing a wheelbarrow full of flWhen it comes time for the three little wolves to go out into the world and build themselves a house, their mother warns them to beware the big bad pig. But the little wolves' increasingly sturdy dwellings are no match for the persistent porker, who has more up his sleeve than huffing and puffing. It takes a chance encounter with a flamingo pushing a wheelbarrow full of flowers to provide a surprising and satisfying solution to the little wolves' housing crisis. Eugene Trivizas's hilarious text and Helen Oxenbury's enchanting watercolors have made this delightfully skewed version of the traditional tale a contemporary classic. An interesting and different take on the traditional children's tale. I enjoyed reading this story and especially liked the way in which it included some modern and challenging vocabulary for children to soak up! The ending of the story is very sweet and adds a subtle moral in about finding friendship where you might not expect it. Whilst I rate this story quite well, I would not recommend it before Reception age simply owing to its length. Yet another excellent read from my childhood!!!!! What a delightful twist/coda on the three little pigs story! Sometimes further reinforcement isn’t the only way forward. This is a funny book that is a sort of spin off from the traditional three little pigs and the big bad wolf. I think the kids would really enjoy this book because it is silly, and it is predictable so they can follow along easily. The illustrations in this book are beautifully detailed and really draw you in. This book will teach kids to be persistent. If you want something it is okay to fail, you just have to try again until you get it.